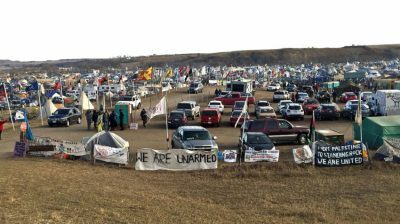 The encampments by Native Americans at Standing Rock, N.D., from April 2016 to February 2017 to block construction of the Dakota Access pipeline provided the template for future resistance movements. The action was nonviolent. It was sustained. It was highly organized. It was grounded in spiritual, intellectual and communal traditions. And it lit the conscience of the nation. 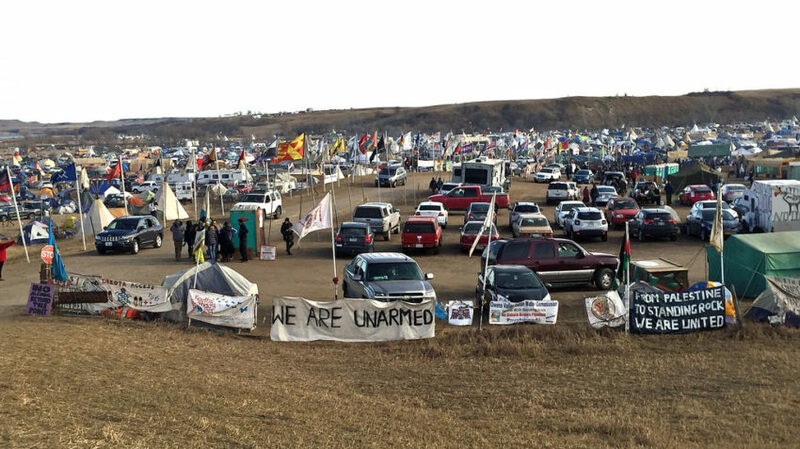 Native American communities—more than 200 were represented at the Standing Rock encampments, which at times contained up to 10,000 people—called themselves “water protectors.” Day after day, week after week, month after month, the demonstrators endured assaults carried out with armored personnel carriers, rubber bullets, stun guns, tear gas, cannons that shot water laced with chemicals, and sound cannons that can cause permanent hearing loss. Drones hovered overhead. Attack dogs were unleashed on the crowds. Hundreds were arrested, roughed up and held in dank, overcrowded cells. Many were charged with felonies. The press, or at least the press that attempted to report honestly, was harassed and censored, and often reporters were detained or arrested. And mixed in with the water protectors was a small army of infiltrators, spies and agents provocateurs, who often initiated vandalism and rock throwing at law enforcement and singled out anti-pipeline leaders for arrest. The Democratic administration of Barack Obama did not oppose the pipeline until after the election of Donald Trump, who approved the project in January 2017 soon after he became president. The water protectors failed in their ultimate aim to stop the construction, but if one looks at their stand as a single battle in a long war, Standing Rock was vitally important because it showed us how to resist. In November of last year I spoke with Kandi Mossett, one of the water protector leaders, when I visited the North Dakota encampments. We were standing over one of the sacred fires. The corporate state, no longer able to peddle a credible ideology, is becoming more overtly totalitarian. It will increasingly silence dissidents out of fear that the truth they speak will spark a contagion. It will, as in China’s system of totalitarian capitalism, use the tools of censorship, blacklisting, infiltration, blackmailing, bribery, public defamation, prison sentences on trumped-up charges and violence. The more discredited the state becomes, the more it will communicate in the language of force. George Lakey, the Eugene M. Lang Visiting Professor for Issues in Social Change emeritus at Swarthmore College and a sociologist who focuses on nonviolent social change, talked about Sweden and Norway’s response in the 1920 and ’30s to the rise of fascism and compared it with the response in Italy and Germany. We live in a historical moment similar to when fascism was ascendant between the two world wars, he argues. Lakey was a trainer during the civil rights movement for Mississippi Freedom Summer and co-authored “A Manual for Direct Action: Strategy and Tactics for Civil Rights and All Other Nonviolent Protest Movements,” one of the seminal texts of the civil rights movement. “Remember who is actually running things, and we keep our focus on them both politically and economically,” Lakey said. “These days, a very smart way to do that is to focus on the economic entities that are owned by the 1 percent, who are basically responsible for the oppression that we experience,” he said. Resistance, he stressed, will come from outside the formal political system. It will not be embraced by either of the two main political parties or the establishment, which is now under corporate control. Economic decline, deindustrialization, austerity, debt peonage, decay and collapse of social services and infrastructure and the impoverishment of the working class, Lakey said, have changed the configuration. The working class, in short, can no longer be bought off. Lakey cautioned against diverting energy to attacking neo-Nazi and white supremacist groups. That, he said, is a gift to the state. While refusing to be baited into violent confrontations with the radical right, we must also be vigorous in using militant, nonviolent tactics to block hate speech. Article 4 of the International Covenant on the Elimination of All Forms of Racial Discrimination, adopted by the United Nations in 1965, stipulates that “all propaganda and all organizations” based on ideas or theories of racial or ethnic superiority should be illegal. It urges states to take positive steps to eliminate them. Dr. Margaret Flowers and Kevin Zeese of Popular Resistance dealt with the issue of hate speech recently when a Baltimore chapter of the League of Women Voters held a series of panel discussions on immigration. The chapter invited speakers from anti-immigrant white supremacist groups listed as hate groups by the Southern Poverty Law Center. Despite public outcry, the league refused to withdraw the invitations. At the initial event the speaker was prevented from completing his presentation by anti-racist activists and members of the local chapter of the Green Party. “We would do better as a society to debate the best ways to eliminate white supremacy,” they added. To see Chris Hedges interview professor George Lakey, click here. Chris Hedges is a Pulitzer-Prize winning journalist, New York Times best selling author, former professor at Princeton University, activist and ordained Presbyterian minister.